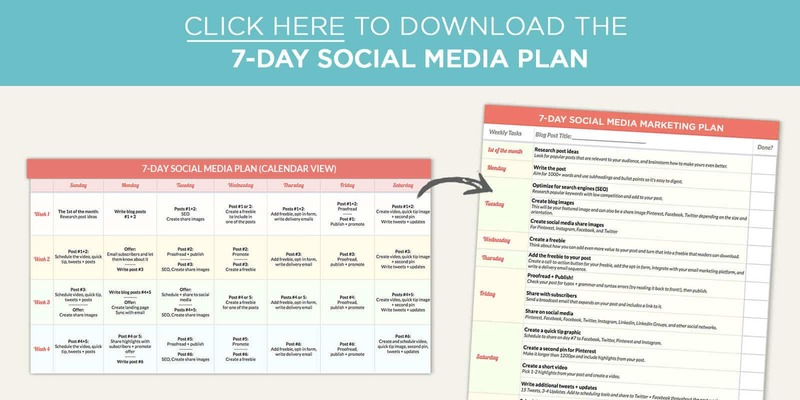 Need a social media planner to cover the entire week? 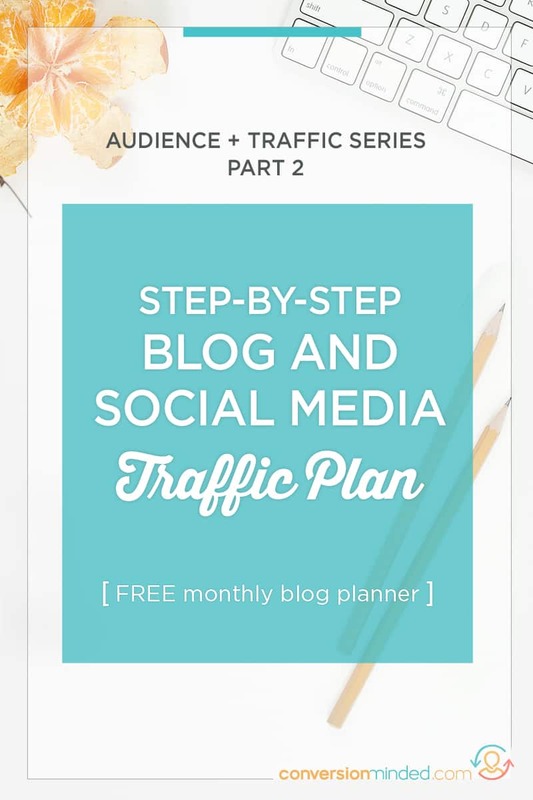 This is part #2 of the Build Your Audience + Traffic series, where we’re drilling down on how to drive traffic to your content and convert visitors into subscribers. In part #1, we talked about fundamental ways to increase traffic and build your audience. We uncovered how important it is to really, really know your target audience, and to set monthly goals so that you know what to aim for. We also touched on the tasks involved with putting your content out there like you mean business…like you want people to find it. Today, let’s dive into the HOW. How can you promote your content effectively on social media? What things should you be doing each week, and in what order, to maximize your reach? Time for a 7-day social media plan, yo. What I really want is for you to have a blogging workflow that yields amazing results for all your hard work. Ready for it? Let’s dig in. 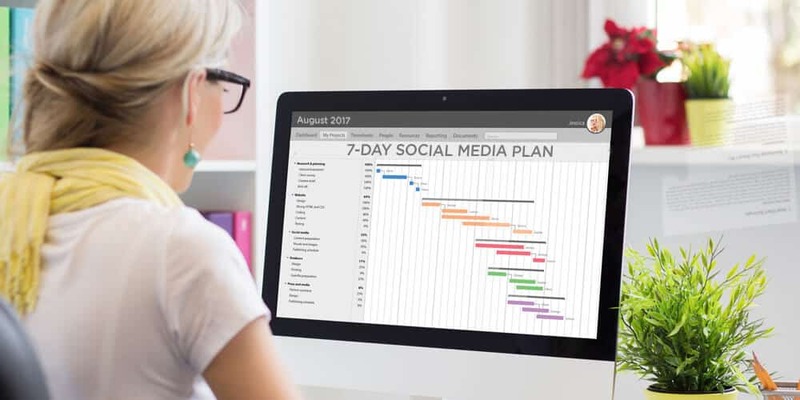 Bonus: I created this 7-day social media plan template to help put what you learn into action. To get the most benefit from this social media plan, you need to stick to a regular blogging schedule. One of the best ways to do that is to have your topics ready to go, so that all you have to do is to start writing. Remember the blog themes we talked about? On the first Sunday of every month, jot down blog ideas that support your themes. This extra effort upfront will save you loads of time plus give you valuable insight about your audience. Knowing what you’re going to cover ahead of time means less time struggling with what to write during the week. Your content is going to speak to what your audience really needs vs what you think they need, which is priceless. Researching content is about more than just blog ideas – you’ll see how people spin their blog titles too, which is a biggie for driving traffic. Now that you know what you want to write, it’s time to create your blogging workflow. You can even use my Time Blocking Template to help protect your sacred writing time! In terms of how much time to set aside, it depends on the length of your posts. I tend to write longer posts that take me about 5-6 hours. You may need more or less time and that’s perfectly ok.
What you can do, if you like, is to alternate between longer and shorter posts. The first week, maybe you write a longer post. Then the next week, you write a shorter one. Whatever you do, please don’t write less than 1000 words! We want to provide real value for our readers, PLUS give our work a fighting chance to rank on Google. Make sure you format your posts with subheadings and bullet points so they’re easy to read. Use short sentences and even shorter words, e.g. hard vs difficult. You want that when people scan your posts, they get what you’re saying without having to work for it. You’re doing great! Next, let’s get a jump on Tuesday’s tasks. Tuesday is the perfect day to choose your target keyword and add it to your content, tags, and blog title. This way you have a final title for blog and social media images, which we’re going to create on Tuesday too, right after we sprinkle some SEO magic on it. The reason I recommend optimizing your post AFTER you write it, and not before, is because it’s so important to focus on Step #1 first. The only thing you should be thinking about when you’re writing is how to get your readers from point A to point Z. Then, after that, we can get jiggy with SEO. If you’re curious about how best to optimize your posts, this post includes an SEO blog checklist you can download to help you remember all the steps. 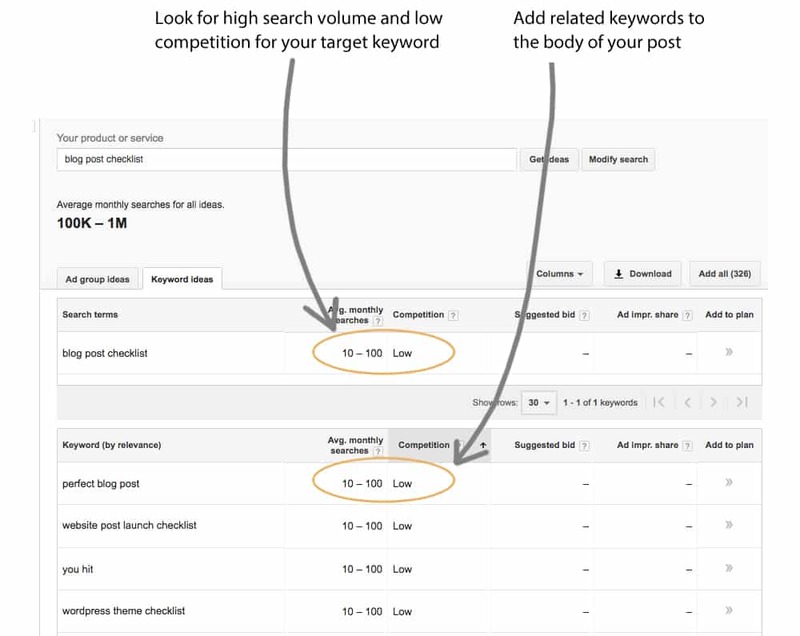 Before we move on to images, let’s look at how to select the perfect target keyword. We’ll need Google’s Keyword Planner for this. I usually select “Search for new keywords related to a phrase, website or category”. Your results will look something like the image below. What you’re looking for are keywords related to your search term that have a decent search volume and low to medium competition. Once you select your target keyword, follow the steps listed in the SEO blog checklist to add it to your post. And just in case you have a hard time finding the keyword planner once you log in, it’s hiding out in the “Tools” menu. #2FORTUESDAY We’re doublin’ up on Tuesday, so right after you’re done with step #3, it’s time to create share images. Canva is a great tool for this. You can create and save branded templates with your logo, colors, fonts, and other brand elements all in there, ready to go. I like to take my images one step further and use Photoshop. If you’re curious about Photoshop, this tutorial and social media template will help you get started. Ok, so now you’re probably thinking What social media sites do I need images for, and what size should they be? I’ve got all of that covered for you right here! High five! We’re jammin’ and it’s only Wednesday. Let’s keep at it. Content upgrades are extra freebies…things like checklists, cheat sheets, eBooks, worksheets, and templates…that extend on your post with even more value. They’re optional, meaning that you don’t have to create one in order to publish your post and promote it. Nope. Changed my mind. You need ’em. The reason is that this is the Blog Audience + Traffic series. What that means is that we’re building a community…our crew, our tribe. To do that, we need a way to stay in touch with the people who visit our site. The last thing we want is to throw a slammin’ blog party and then have people peace out before the fun starts. Also, if you remember from part #1 of this series, freebies are a huge piece of our content funnel. To give you an example of this, I’ve built my list to 4K in the last 3-1/2 months with nothing more than freebies. We’re talking no guest posts, ads, webinars, landing pages…none of that noise! Just straight up opt-in forms and freebies. Can you see how powerful they are? Now, I get that freebies take a lot of time to make, so believe me, I’m not recommending that you include one with every post. Instead, you can alternate each week, the same way we’re alternating between longer and shorter posts (Monday, above). So one week you add a freebie, the next week you skip it, and so on. If you’re wondering how to create your freebie, Pages, Word, Google Docs, and Canva or all good choices. I’ve been using InDesign forever so that’s what I prefer. Oh, and if you’re interested in learning how to create eBooks with InDesign, please let me know in the comments! This part sounds simple, right? It actually takes a few more steps than you might think. What you’re doing is creating a 2-step opt-in form, where an image or a link triggers a pop-up. So let’s break that down, k? I’ve found that a graphic button with a call to action like “Click here to download” works better than a text link. Images grab people’s attention more than links, especially if you’re following the blog SEO checklist and interlinking posts for search engines. All of those links can get lost after a while. But a big, bold, graphic button? No one’s glazing over that, friend! The other thing to include in your button is an image of your worksheet or checklist. You want to let people see how helpful your freebie is, type thing. Ok, so what tools should you use? Great question! See those tools you used on Tuesday to create blog + social media images? You can use the same ones for your call to action button. This is the form that pops-up when someone clicks on the button. I use Thrive Leads because I just loove it so much, but you can use OptinMonster, Leadpages, or SumoMe too. Just remember to connect the form to MailChimp, ConvertKit or any email platform you currently use. We need a way to send the freebie to new subscribers. The idea is to schedule these emails ahead of time, so it’s all on autopilot. Ok, I know you’re probably thinking This is so much stuff, and it all sounds pretty techie! I hear ya! There are a lot of steps here, which is why I like to think of Thursdays as #TECHTHURSDAY. Setting all of this up definitely takes a different part of your brain than writing or even creating images. Remember too that once you set up your first sequence, you can duplicate it for the next one. And you only have to connect your service once to the form. Then you’re good to go. Like anything else, the more freebies you create and add to your posts, the faster it will go. This is another one of those things where, if you hang in there with it, your investment will pay off later on as your audience and community grow and grow. 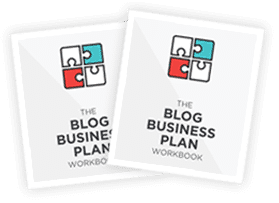 Now, I know you’re probably thinking If this is a social media plan, why are we spending so much time on blogging tips? 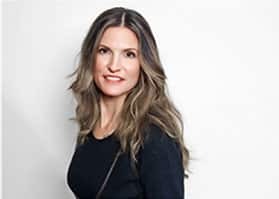 What about tips for social media? I hear ya! Everything we’ve covered so far is about blogging and creating content. The reason is because content is the glue that makes social media so sticky. You need to focus on blogging from Monday through Thursday so that you have original content to share. That’s where the traffic part comes in! If you hang in there, over the next few days we’ll turn our attention to sharing and promotion. Everything will come together into a bangin’ social media plan soon. Pinky swear. Check your Google Analytics at least once a month. What you’re looking for are the top 5-10 posts that are most popular. These are the ones with serious muscle, the ones driving the most traffic to your site. Make sure you go back and add a freebie to each of these if you haven’t already. Next up: Time to pounce on social media! Whatever you do, please proofread your post before you publish it! I’m terrible at this… I’m always finding grammatical errors and typos in my posts months after they go live. Ugh. Sooo frustrating…and the longer the post, the more typos. Do me one better here, friend. Give your post a once-over before you publish it. Can you see why Friday, Saturday, and Sunday are such important days? Now you’re probably thinking How the heck am I going to do all of this without pulling my hair out? I get it, I really do! It took me months to figure out a workflow that didn’t leave me feeling flustered. This is another one of those things where you need to hang in there! It’s going to get so much easier as you move through it. First of all, the weekly blogging plan we’re covering today will help you keep a consistent schedule, where you’re doing the same tasks, on the same days, each week. And once you run through the steps yourself and nail down your best workflow, it’ll be easy to pass the promotion tasks off to a virtual assistant. You will get your weekend back later on. Pinky swear. 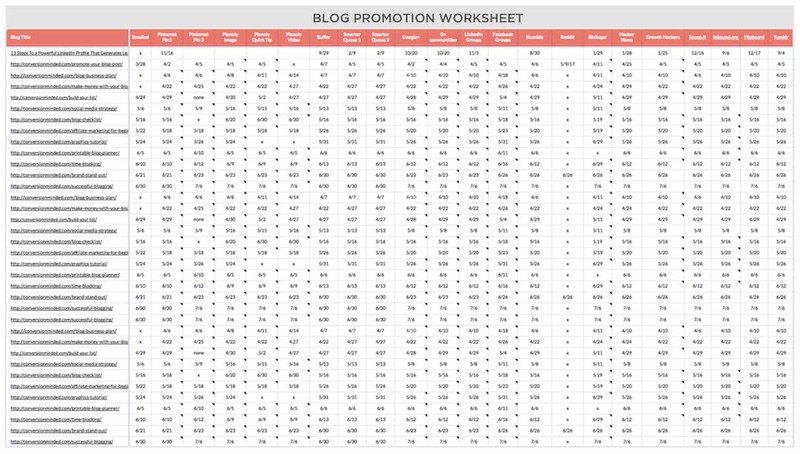 You can download the blog promotion worksheet to share your blog posts too. Ok, with that being said, Friday is all about sharing on social media and bookmarking sites. 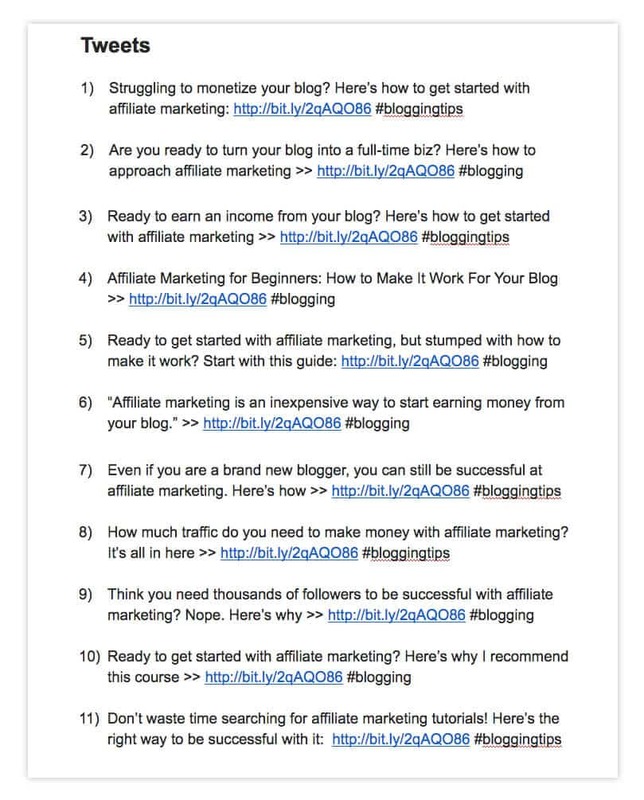 Too much to list in this post… For the full list of sites, I recommend downloading the blog promo worksheet above. I know that this sounds like a lot! But really, it goes much quicker than you think. What you can do is use the same quick tip for your graphic and your video. And if you think about it, all you’re really doing is taking what you’ve already “scripted”, selecting a few highlights from it, and turning them into something new. Plus, in my experience, recording video takes sooo much less time than writing a post. You can use whatever you have available right now. Let’s not get hung up on techie recording gear, k? Your iPhone or webcam is the perfect starting place. The point here is to simply get into the habit of turning your posts into videos. Once you’re recording video on the regular, I recommend the Blue Yeti mic to help amplify your audio. To record the video itself, I started out with QuickTime and now use ScreenFlow, mainly because of the editing features. And my brother has been bangin’ out amazing videos using Camtasia on his PC. All of these are good choices, in my book. You got it. Same tools from Tuesday, step #4. For each post, I write 15 additional tweets, and 3-4 updates for Facebook and LinkedIn, all linking to the post. I should point out that these tweets and updates are all slightly different. What you don’t want to do is to repeat the same tweet over and over again! In the next step, we’ll schedule these tweets (plus our new content + graphics) to be shared over the next week. This will give us an initial spike in blog traffic. Woo! You’re really hangin’ in there! This (almost) last step is actually pretty easy. All we need to do is to queue up our content for sharing. Can you see how all of your hard work is paying off here? You have more content to share on more platforms, which means more people seeing your post. More types of content = more platforms = a broader audience. This is why I love social media scheduling tools so much! Even though you’re building your following on just 1-2 social media sites (as I mention in this post), these tools allow you to “set it and forget it” on the others, so to speak. That’s a win-win, no? If you’re curious, in this post I share my favorite scheduling tools. 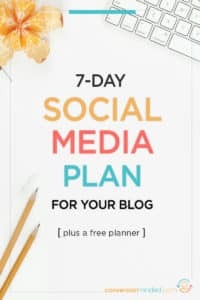 If we’re really going to nail this blog and social media plan, we can’t forget Facebook groups, which can leave your head spinning if you don’t have a system in place. I’ve been thinking about this, and the answer is that it really comes down to each group having its own rules, daily prompts, and promo days. The schedules are different enough that it makes them hard to track. You can feel like a scrambled egg trying to keep up with which group has a promo thread each day. So how do you promote your posts through Facebook Groups? Great question! First of all, if you’re not in groups already, I would spend a few days looking for groups in your niche, reading through their descriptions, checking their rules, and so on. What you’re looking for are groups with high engagement that have “Promo Wednesdays” type thing, where you can share this week’s post. Even if the group doesn’t allow promotions, you can usually include your link in a thread comment. Of course, you should check the group rules first. Once you’re in a few groups, I recommend using a spreadsheet to keep track of each group’s promo days. From there, all you need to do is schedule Facebook posts in those threads (aka remember to share on those days). i would like to take these plan into consideration and hope to do better with social media. Thank you SO much for taking the time to write all of this! There is so much helpful information in here that I so appreciate. I am a relatively new blogger and still trying to navigate my way, so honestly, thank you! You’re so welcome, Lauren. Good luck with your blog! Oh wow… what a detailed post! Great job. This is exactly what new bloggers need. A step by step guide to what they should be doing. The same tweet thing is so true! Unfortunately, I had been doing that mistake until recently. 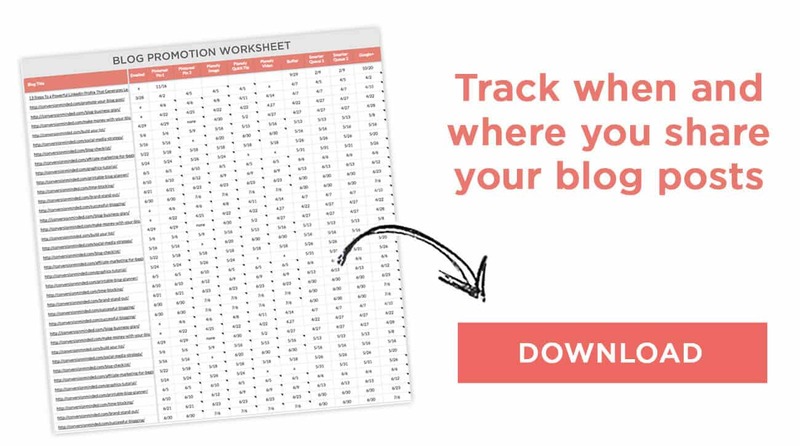 A blog planner is EXACTLY what I need! This is a must-do especially for beginner bloggers. As for me, it’s always a struggle to start especially with new sites, though I already have a plan on what to do, I found great suggestions here such as title spinning, optimizing the post after writing it and upgrading the post with opt-ins. Good suggestions! Thanks for sharing!